A quietish week ahead as we prepare for Pchum Ben. Kumnooh will most likely have nothing to report next week, so see you on the other side. On Wednesday 25 the WASH poetry/musica/electronica collaboration returns to Equinox Bar (St 278 just off St 51) to present The Next Horizon, from 8 pm. There will be special cabaret-style seating for the event. And if you can’t make it, it will be live streamed on Video Free Equinox. Also on Wednesday, Meta House hosts the opening of Bruno Levy’s Cambodian manadalas exhibition, Angkor Rebuilt, from 6 pm; followed by a screening of three short docs about the White Building: The Building by Alnoor Dewshi, Dancing in the Building by Neang Kavich, and Red Earth Village by Erik Lofting, from 8 pm. 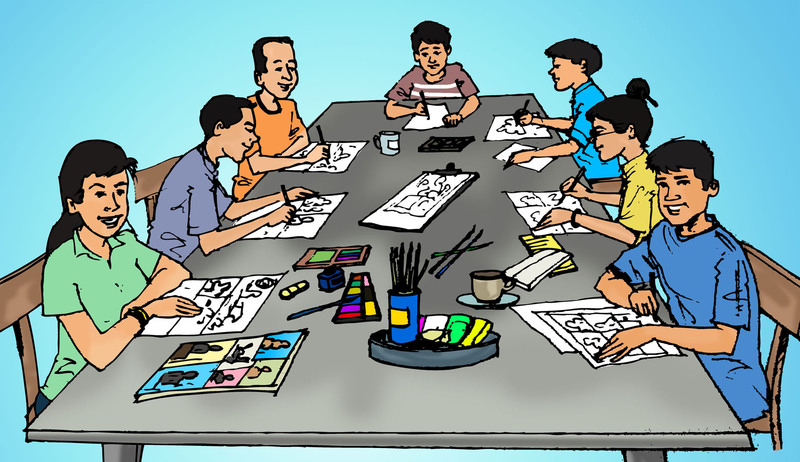 This weekend at Java Café and Gallery, the Siew Phew Yeung/Our Books group is coordinating the Cambodian participation in the worldwide 24 hour Comic Day. This is an international event that challenges comic artists to produce a finished 24 page comic in 24 hours – the rest of the world will be doing it next weekend, but thanks to Pchum Ben the Phnom Penh version is brought forward one week. The Cambodian variation on the 24 hour theme, to account for the different lifestyle, is to produce one page in one hour; the event goes on from 8 am on Saturday to 8 am Sunday. A preparatory opening event and exhibition, Strip all Night will take place on Friday evening from 6 – 8 pm. Strip all night (serving suggestion). Get in before it’s too late for two new photography workshops at Phnom Penh Community College on Saturday 28, to be facilitated by Zeeshan Haider. The morning session is for beginners; the afternoon a field trip and class critique. Saturday 28 at 5 pm at Bophana Center (Street 200, btw 63 & Monivong), the official launch of the photographic exhibition Chinese and Cambodia by Michael Liu, telling the stories of ethnic Chinese living in Cambodia. Drinks and snacks will be offered. Finally this weekend, the Institute francais presents French trapeze artist Marie Mercadal in a circus show at the National Circus, across the street from the National Assembly in Phnom Penh, the culmination of two weeks of workshops which have been documented by photographer Francois Alaitru. Shows are at 7 pm on Saturday 28 and Sunday 29; tickets are on sale at the Insitute francais (St 184 between St 63 and Monivong). Wednesday 25 at Equinox Bar, the WASH poetry/musica/electronica collaboration presents The Next Horizon, from 8 pm. Wednesday 25 at Meta House, Bruno Levy’s Cambodian manadalas exhibition, Angkor Rebuilt, from 6 pm; followed by a screening of three short docs about the White Building from 8 pm. Friday 27 from 6 pm, then Saturday 8 am to Sunday 8 am at Java Café and Gallery, the Siew Phew Yeung/Our Books brings you the Strip All Night exhibition, followed by 24 Hour Comic Day. Saturday 28, photography workshops at Phnom Penh Community College. Saturday 28 at 5 pm at Bophana Center (Street 200, btw 63 & Monivong), the official launch of the photographic exhibition Chinese and Cambodia by Michael Liu, telling the stories of ethnic Chinese living in Cambodia. Saturday 28 and Sunday 29 at 7 pm: French trapeze artist Marie Mercadal in a circus show at the National Circus. Tickets are on sale at the Insitute francais (St 184 between St 63 and Monivong). An Heritage House, an exhibition for the ICF’s annual architecture competition. Institut français du Cambodge Gallery. Until October 5. Let’s make it possible, works by photographer Laurence Leblanc. Institut français du Cambodge Exhibition Hall. Until October 5. 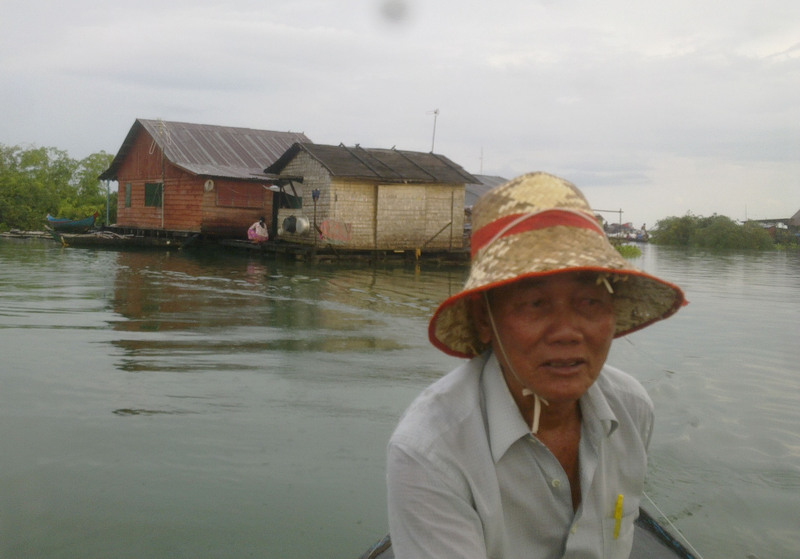 A fascinating range around Phnom Penh this week, from spoken word to calligraphy to photography! All comers are welcomed to the commencement of a new monthly poetry event for Phnom Penh. On Wednesday 18th at 7.30 pm Scott Bywater hosts Open stage : Poetry at Java Cafe and Gallery. All languages and styles encouraged. Also on Wednesday 18, the commencement of a photographic exhibition at Bophana Center (Street 200, btw 63 & Monivong), Chinese and Cambodia by Michael Liu, telling the stories of ethnic Chinese living in Cambodia. While the official launch is not until Saturday 28, there will be an unofficial launch with a workshop in Chinese calligraphy this Saturday 21 at 3 pm (places are limited: to register please e-mail info@bophana.org, or call 077749879). The exhibition runs until October 12. On Friday 20th at 6 pm Chinese House opens a new Monkey Arts Cooperative/Daniel Rothenberg photo exhibit, Snap Shots, images from the Life Is series. Check out samples in the links below. Bophana Cineclub on Sunday afternoon at 3 pm features special guest Cambodian director Chhorn Bunhom, screening a satirical comedy film with discussion in Khmer afterwards. Free admission. To follow, a screening of Rithy Panh’s The Missing Picture ($5/$2 students). Book tickets at missingpicture.film@bophana.org / 077 811 668. Bookings are now being taken for two new photography workshops at Phnom Penh Community College on Saturday 28, to be facilitated by Zeeshan Haider. The morning session is for beginners; the afternoon a field trip and class critique. 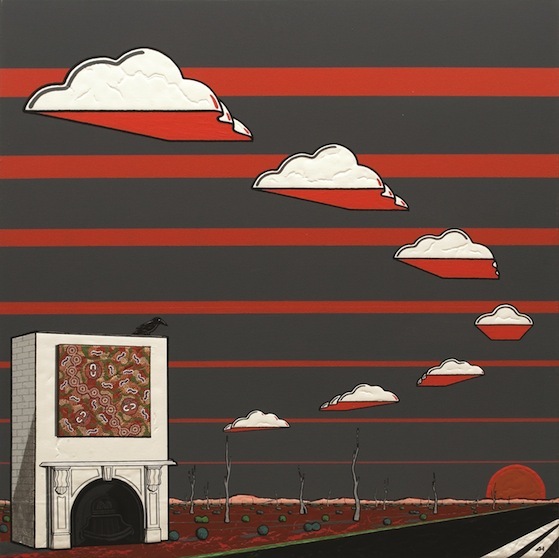 Wednesday 18 at 7.30 pm Scott Bywater hosts Open stage : Poetry at Java Cafe and Gallery. All languages and styles encouraged. Saturday 21 at 3 pm, Bophana Center (Street 200, btw 63 & Monivong), Chinese calligraphy workshop as part of Chinese and Cambodia photographic exhibition by Michael Liu (workshop places are limited: to register please e-mail info@bophana.org, or call 077749879). The exhibition runs until October 12. Sunday 22 3 pm, Bophana Cineclub (Street 200, btw 63 & Monivong) with special guest Cambodian director Chhorn Bunhom. Sunday 22 6.30 pm at Bophana Center (Street 200, btw 63 & Monivong), Rithy Panh’s The Missing Picture ($5/$2 students). Book tickets at missingpicture.film@bophana.org / 077 811 668. Angkor Impressions, sketches from Irish comics traveller, illustrator and animator Cliodhna Ztoical, at Rik Reay Gallery and Noodle Shop (St 178 near St 19). Just when we thought low season was gone, another quiet week. But watch out next week: openings at Meta House (Tuesday) and Java (Wednesday), twin events at L’institute français on Thursday, CD launch at Bophana Center on Friday, poetry electronica fusion at Meta House on Saturday, and Drink and Draw on Sunday. Back to the present, though. Tonight at Meta House you can view a selection of the best South East Asian documentaries from Chopshots 2012, from 7 pm. Then at Bophana Center on Saturday 7 at 4 pm, Kon Khmer Koun Khmer presents 11 short films made by young Khmer filmmakers, both prizewinners and premieres. The filmmakers will be present for Q&A. For those that like to walk and observe there is another Phnom Penh Photo Walk event this Sunday 8, featuring Wat Phnom and the Night Market. Meet at Brown Cafe, riverside, at 4.30 pm. Check the WordPress or Facebook presences for previous walks. 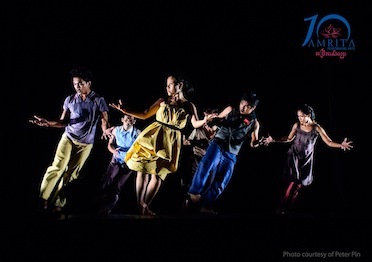 The big event of the week is a special celebration of the 10 year anniversary of innovative dance company Amrita Performing Arts, to be held at Java Cafe and Gallery on Monday 9 from 6.30 pm. Along with an exhibition of images from past productions, founder Fred Frumberg, new Executive Director Kang Rithisal and dancer/choreographer Chumvan Sodachivy will talk about the growth and development through the decade. Baitong Gallery (#7, St 360, between Norodom and 51), is currently hosting a photographic exhibition by Tim Kelsall, One day in Phnom Penh, documenting the street life the city. The exhibition includes a silent auction in benefit of Friends International. Swing dancers take note: free refresher courses at Doors (Sts 47 and 84) on Tuesday nights during September in preparation for the official launch of SwingPenh at the end of the month. Travel blog Ambot-ah recently posted an account of a visit to 1961 Hotel in Siem Reap. And elsewhere in Cambodia, artists of all stripes quietly get on with what they are doing. Tuesday 3: best South East Asian documentaries from Chopshots 2012, Meta House, from 7 pm. Saturday 7: Kon Khmer Koun Khmer presents 11 short films made by young Khmer filmmakers, with Q&A. Bophana Center (St 200, between Monivong and 63). Sunday 8: Phnom Penh Photo Walk , featuring Wat Phnom and the Night Market. Meet at Brown Cafe, riverside, at 4.30 pm. Monday 9: Amrita Performing Arts celebrates its 10th birthday at Java Cafe and Gallery from 6.30 pm, with an exhibition and speakers. One day in Phnom Penh,a photographic exhibition by Tim Kelsall, at Baitong Gallery (#7, St 360, between Norodom and 51). Amazing Cambodia Golden Era photo exhibition at Meta House. Until 6 September.